Here is where racers, customers and potentially interested customers can seek information regarding the Hobby Pro / PR Racing SC201 2wd Competition Shortcourse Truck. This truck has arrived in the Untied States on May 22, 2015 and its already proven to be a winning product! Known for it's durability and easy to work on and build - layout has consumers turning heads and making the switch. Hobby Pro / PR Racing now has a complete 10th scale vehicle line which share nearly 75% of the same parts, making it easier than ever to make the switch and race more than one of our quality racing vehicles. Last edited by Matt M.; 06-15-2015 at 12:40 PM. Thanks for your interest! Yes we are actually working on an all new PR Racing America Website which will be an informational website that has more in depth photos, videos and more about our products. The SC201 2wd Shortcourse will come with both Mid Motor and Rear Motor Capabilities. It comes as a Pro Kit at this time without wheels or a Body. Recommended wheels are +3 Offset however all wheels will fit the PR Racing Short Course truck when utilizing the correct wheel hexes provided with the Kit. Thanks again for your interest and don't hesitate to let us know if you have any more questions! Mine is just about all set and ready for debut on Wednesday, hopefully. Work schedule has been tough last few weeks. I'll keep you all posted. have a box full of rear 2wd slash tires and was curious if I can use those on this truck ? Got my car on the track yesterday! I don't know what went wrong though. Stripped gears in the gearbox on my first pack! Slipper was set more on the loose side. Bit of a pain in the backside as I really wanted to get some track time with the truck to get it set up a bit. Car was MM on medium traction track. Using AKA Cityblocks - rear end was pretty loose! I don't think there's enough weight to the rear of the truck so tempted to switch to RM on this one. Maybe next time I'm at the track! Excited to get the SC201 on the track asap..
first night with the SC201 went pretty well. need to get some harder front springs, add some weight (switch to full size pack) and start playing with ackerman settings. Last edited by hanulec; 08-06-2015 at 05:53 AM. Another good night with my sc201. Truck is a bit loose on entry with an exit push. Trying sc5m kit springs next time out and working on a longer wheelbase config. I'm super short front and rear..
Last edited by hanulec; 09-04-2015 at 04:13 PM. Another good night with my sc201. Truck is a bit loose on entry with an exit push. 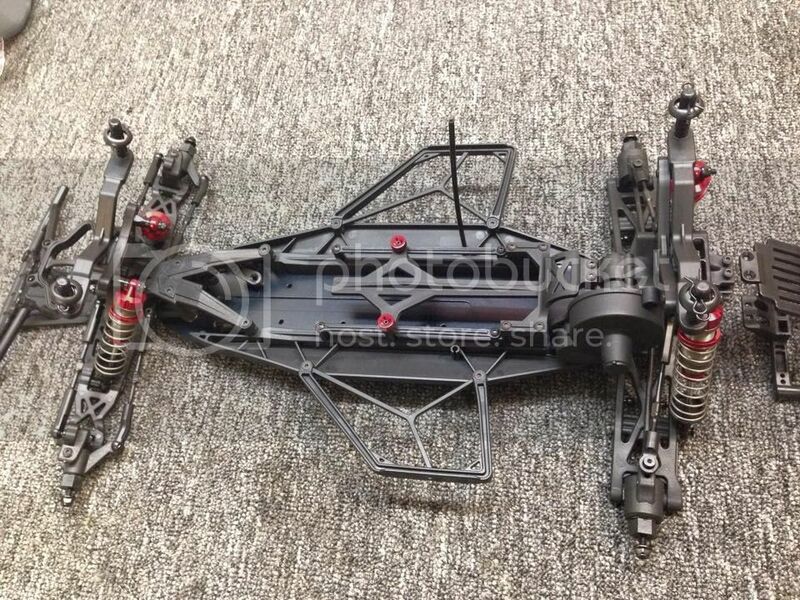 Trying sc5m kit springs next time out and working on a longer wheelbase config. I'm super short right front and rear..
What do you mean super short right front and rear? Springs? Are you running the +5mm front bulkhead? I don't know for sure just assuming it came with one. Both the buggy and stadium truck do anyway. lewis - im running the 0 front bulkhead. i didn't get to play with wheelbase yesterday. next im i'm going to oil up (i'm at 45/35 AE already), lengthen my rear link, investigate raising the ball studs to lower the roll center, possibly switch in the 1.7 pistons i just got from Andrew (thanks again) and think about lengthening the front wheelbase. 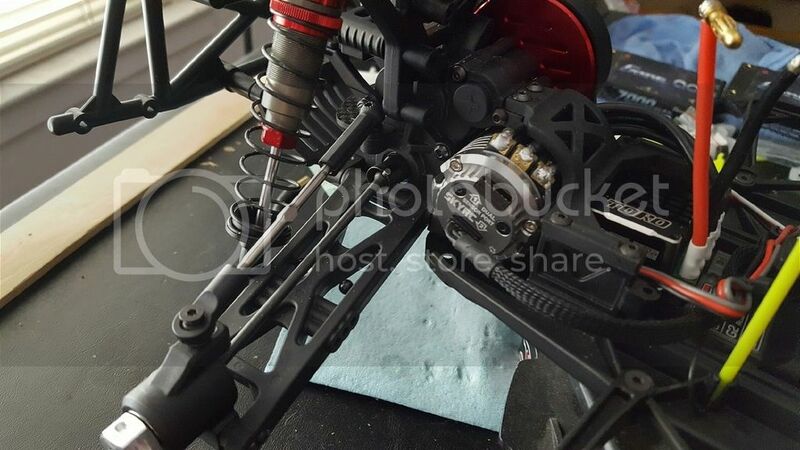 if i have a bunch of time i'd like to run through all of the ackerman adjustments at both the center of the bellcrank and at the hubs using the pro/optional carbon parts. I know the recommended wheel for this car is +3 offset, but has anyone actually found the best fit brand wheel? Like SCTE or Slash wheels? im really surprised there is so little traffic on this truck. put this sct solidly in the stock sct a-main at motorama and after sitting for 3 months pulled it out to TQ + Win locally. All times are GMT -7. It is currently 07:29 PM.